Analytics: To study or analyze a problem or challenge in detail and breaking it down to determine the cause of the problem or failure. In the call center there are many areas where failure can occur which may be the cause to part of the challenge or the overall problem. Within the call center there are analytics for speech, agent adherence, IVR, CRM, agent performance, contact center combined volume, call accounting and much more. Determining the analytics that will fit you best should be done by looking at the problems that exist within the contact center. Begin your analysis of the data. There are steps to defining a problem accurately. If you do not define the problem you cannot determine the cause nor begin to look for a resolution. Accurately state what the problem is. A general phrase is too vague and does nothing to help locate the cause. Abandonment rates have been increasing is a problem but is not a defined problem. Go into more detail and break the problem apart for a more clear and defined problem. Abandonment rates, for calls/chats/emails, for product X on Friday afternoons always exceed 10%. This is a clear problem description. If the problem is not defined later on when you are analyzing the reports if you have defined the problem in detail you will be on a path to resolving the problem. Often easier said than done. For example, if we were to say that customer satisfaction is the problem what is the cause? Is it a product or service offered? Is it going through the IVR or waiting for an agent? Is it the agent awareness of a resolution? Or could it be the need to repeat data to another agent? There are so many things that cause customer satisfaction issues to focus on a sole cause could harm the agent performance metrics. Consider the problem from multiple directions. In this case if the call recordings were reviewed from customers that gave a poor customer satisfaction rating it might be possible to begin adding up the causes to the problem. All call centers have calls inqueue; this is the nature of the business. However we need to know when there are calls inqueue, how often is this happening and how long are they inqueue. By capturing this data we can see when, what group and the time inqueue. This is good data. Again part of the problem resolution is to have good data. Now begin to dig deeper and find the people associated with this group and what are their statistics for Calls InQueue. When that is accomplished we are getting closer to the problem resolution. In this spreadsheet we see how many times there has been Calls InQueue and how long they have been InQueue. This is good data but does not include the goals for Calls InQueue. All call centers have goals. Some are very broad such as calls offered and calls handled. But if you believe there are failures happening within the call center and you do not have a goal(s) set in the area where there are problems then how can there actually be a failure to begin with? 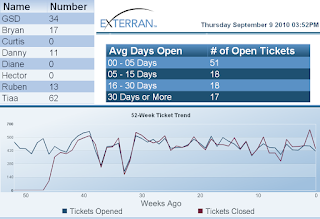 Let’s look at Calls InQueue the most often requested KPI for the call center. The goal for most call centers is to not have a Call InQueue. If the group that is handling the calls is one that is generating revenue they try very hard not to have a call waiting because that is revenue. If your revenue per call is on average $100.00 and on average you have 100 calls waiting per day that could be $10,000.00 per day in revenue waiting to be answered. The resolution is to hire more people but will that solve the calls waiting problem? Schedule adherence and labor costs need to be reviewed prior to just assuming that the FTE resource is the problem. What about calls offered trend during the day and week? What if Monday morning is always very busy and you would have to double your staff just to handle all of the calls that come in? And then the rest of the week the call volume is managed with the current staff level? Define the goals for each KPI and look into goal details prior to making assumptions about what should be done. In the case of calls waiting, having an IVR with clear messaging and call back options will relief the calls waiting stress. Often we forget to look at our own history and trends of past performance. This is especially true when the problem appears to be new and associated with new agent hires. Review your goal and failure for a specific problem from the past and see if you are looking at the same cause then and now. If you do not have the history or trends then start capturing the data now and save it for the future. Even having something to compare that is a week old is worth the comparison. The comparison should be for the same data and not “something close”. The history should be of the data that you believe is part of the problem and not ALL data. If you only have “all data” then try to break it apart so that the data comparison is relevant. Going through the first four steps outlines enough of the problem to make the analysis clear. If you have documented the problem, cause, data, goals and history you may now begin the analysis of the problem and come up with a true plan to resolve the problem. Rather than looking at the pure analytics of the problem start at the beginning and take a slow detailed step by step view all the way through to the history and trends of the problem. Doing the step by step process will help solve the problems.